Inspired by the book Jambusters by Julie Summers, this BBC TV show is set in rural Cheshire, in the village of Great Paxford. 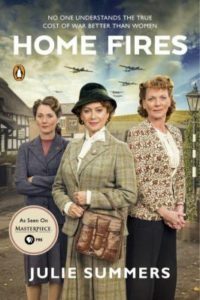 Home Fires showcases the Women’s Institutes’ contribution in boosting morale on the home front during WWII. It’s the story of a group of inspirational women who are left to carry on during one of history’s most trying times. We share their emotional struggles, their fear, their sorrows, and their determination to “carry on” no matter what. This six hour documentary looks at the settling of America, the Revolutionary War, the Civil War and Emancipation Proclamation, and the issue of religion and politics in America from a strictly religious history point of view. The Evangelical Protestant religion of many of the early settlers made them resentful of either church leaders or kings telling them what to do. Itinerant Methodist ministers traveling in the wilds west of the Appalachians made Methodism the fastest growing denomination in the US until the battle over slavery broke it into northern and southern denominations. The rights of Catholics and Jews to have their children free from Protestant religious training in public schools led to a greater separation of church and state. In postwar America, Billy Graham and his crusade against “Godless” communism made him the best known religious figure in America. These are just a few of the interesting takes on American history found in this program which was created by a cooperative effort of The American Experience and Frontline. For more information, visit the companion website.